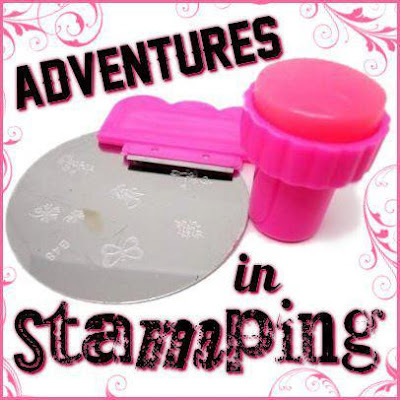 Today's Sunday Stamping challenge is to get a little abstract and find our inner Picassos. Which is pretty funny to me, because most stamps I have are pretty symmetrical. So, I decided to show you a look that is a bright, bold color combination with a funky pattern, and hope for the best. I totally love this color combination for the base - it's a dark maroon creme topped with a red/blue shimmer. 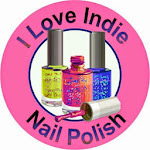 It gives the polish a murky, oilslick kind of feel. 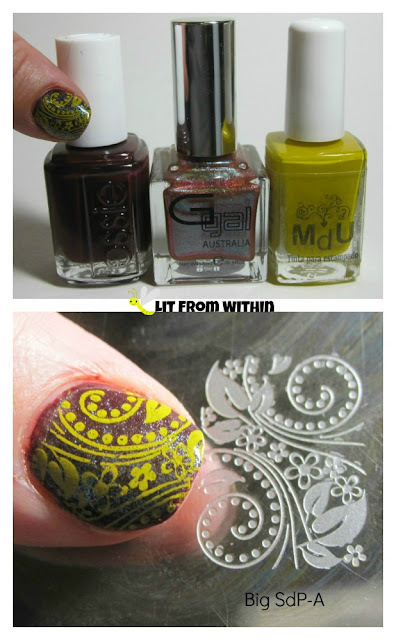 I don't know why I chose to pair this with bright yellow stamping. It's totally out of my comfort zone, but I really love it! Check out that blue shimmer. It really changes the whole look of the mani. What I used: Essie Shearling Darling, Glitter Gal Last Light Brilliant, MdU Mustard, and stamping plate Big SdP-A. What do you think? Abstract? or just weird?